Are you looking forward to V-Day next week? Seems most people either love it or hate it. Being from the “never too much schmaltz” school of romance, I love Valentine’s Day. Even during all those years before I met the HH, I’d always endeavor to celebrate somehow. I’d send cards to my friends or my sisters. I’d invite a gal pal for dinner so we could sip Shiraz together and muse about how few good men there were out there. One year, I think I even bought myself roses (must have been my “I am woman, hear me roar” phase). Last year, I composed a fairly elaborate (and, as I recall, extremely disorderly) meal for the HH and me. Given my frenetic schedule these days working on the book (the Index is done! The book has officially moved from the “writing” to the “production” stage! Whoo! ), I assumed I’d have no time to repeat last year’s amorous performance (I meant preparing the meal, silly! You crazy romantics, you!). But then I saw Susan’s post about this year’s Vegetable Love contest, and how could I resist? (Not that I find Fatfree Vegan Kitchen’s charms any more alluring than those of the HH, you understand). The contest asks you to create a romantic dish using one or more vegetables of your choice. Last year, I came up with a Vegan Molten Chocolate Cake recipe using puréed zucchini and spinach. I loved the taste of the cakes, but the molten filling was temperamental–sometimes it formed a lovely, floating cloud of lava in the center of the cake, as it was supposed to do; other times, the filling got sucked up by the batter and all that remained was a tiny disk of tar-like chocolate at its core. You’d think I’d give up on sweets with veggies in them. But no. . .
As I’m sure I’ve mentioned before, sweet potatoes are my favorite vegetable. I love sweet potatoes in just about anything (or, as I’ve seen the phrase skipping around the blogosphere lately, I lurrrve sweet potatoes). When I was on the anti-candida diet several years ago, sweet potatoes became my favorite veggie (and my favorite brekkie). They’re a healthy vegetable. They’re orange. They’re sweet. And their name sounds like a term of endearment: “Oh, why so coy, my little Sweet Potato? Come on over here and let me help you out of that peel.” Why not use them as the basis for a sweet filling in a Valentine’s Day truffle, then? This year’s recipe really should have made it into the cookbook–it’s that good. What you’ll end up with is an insanely creamy, smooth, rich-tasting truffle filling, vibrantly orange and steeped in citrus flavor. In fact, no one would ever guess it contained one of the world’s healthiest roots. I fed 0ne of these beauties to the HH, and he literally licked his fingers clean, enthusing, “This tastes exactly like a really fine quality, high-end chocolate!” This from a guy who’d normally consume chocolates with cream, butter and white sugar. “There is no trace of sweet potato flavor in these,” he went on. “All you taste is the orange” (enhanced with a splash of Cointreau–though you can use orange juice if you prefer alcohol-free confections). Even if you’re not into chocolates, the filling on its own makes a fabulous, versatile frosting. Rich and fluffy, sweetened with agave and boasting the added fiber of the sweet potato, I’m guessing that the total GI (glycemic index) of this frosting is fairly low and could be used successfully by those on a variety of restricted diets. (See instructions in the Variation, below). 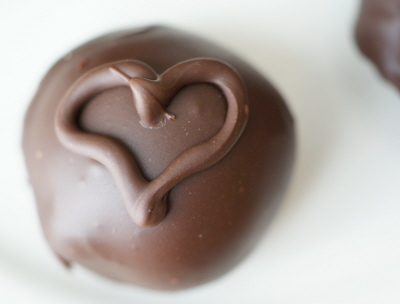 I’ll definitely be making these again for V-Day (the half-batch I concocted is already long gone). Even if you don’t celebrate the Big V, it’s worth making a batch of these. Give yourself a little gift of Vegetable Love this year. This is my submission to Susan’s contest. You have until tomorrow at midnight to enter if you’re so inclined! Make the sweet potato purée in advance: Preheat oven to 400F (200 C). Place unskinned sweet potato on a baking sheet and bake until very tender, about an hour. (You can boil the sweet potato instead of baking it, but I find the flavor is vastly inferior that way.) Allow to cool, then peel and purée the flesh in a food processor until very smooth. Measure out 1 scant cup (230 ml) of the purée and reserve the rest for another use. Return the one cup purée to the processor along with the cornstarch and coconut oil, and blend until very smooth. In a small, heavy-bottomed pot, whisk together the flour, salt and agave nectar until smooth. Add the rice milk slowly and whisk until incorporated; sttir in the orange zest. (Combining the flour and agave first before the milk helps to prevent lumps from forming). Cook the mixture over medium heat, stirring constantly, until it begins to bubble and thicken; lower heat to simmer and cook, stirring constantly, for about 30 more seconds. The mixture will thicken very suddenly and you’ll need some muscle power to keep stirring; it will end up like a very thick paste or glue. (A silicone spatula is useful when stirring, as you can scrape the sides and bottom of the pot to prevent scorching). Remove from heat and stir in the liqueur and vanilla until combined. Turn the hot mixture directly into the processor bowl with the sweet potato and whir until the mixture is perfectly smooth and creamy. It should be soft, but stiff enough to hold a shape. To thicken the filling (only if necessary): 1) Melt an additional 2 Tbsp (30 ml) coconut oil. With the processor running, slowly add the oil to the mixture and blend it in. It should thicken up nicely. OR, 2) Add another 1 Tbsp (15 ml) cornstarch to the processor bowl, and blend it in to the mixture. For truffles: Pour the filling into a deep bowl and refrigerate until cold and firm, at least 3 hours. Then, using a melon baller, mini ice cream scoop or teaspoon, scoop balls of filling onto a cookie sheet that’s been lined with plastic wrap; place in the freezer until firm. Once the truffle filling is frozen, proceed to dip the truffles: In a bowl set over a pot of simmering water (the bowl should be large enough that the bottom of the bowl doesn’t touch the water), melt the chocolate and coconut oil together until smooth. Using two forks held facing each other, dip the truffles one at a time, tapping the forks on the edge of the bowl to release excess chocolate, and place them on the plastic. Allow to firm up in the refrigerator (they will actually begin to firm up fairly quickly because of the frozen filling) Using more melted chocolate, decorate tops with swirls or heart shapes if desired. Store in the refrigerator, but serve at room temperature. Makes 12-15 truffles. 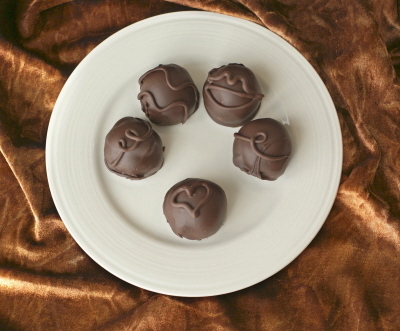 For chocolate truffle cups: Set the filling aside while you prepare the chocolate cups. In a bowl set over a pot of simmering water (the bowl should be large enough that the bottom of the bowl doesn’t touch the water), melt the chocolate and coconut oil together until smooth. Use about 3/4 tsp (3.5 ml) to coat the bottom and up the sides of 12-15 mini foil cups. Place the cups in the freezer for a couple of minutes to firm up. 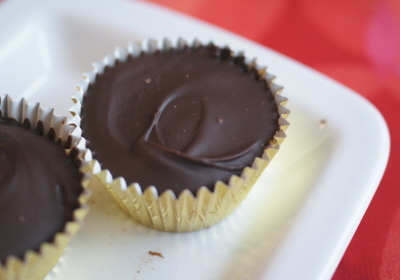 Using 1-2 tsp (5-10 ml) of filling for each cup, fill the chocolate cups with the sweet potato mixture and smooth the top. Return to the freezer for another 5 minutes or so until the tops of the filling are firm. Cover each cup with another 1 tsp (5 ml) chocolate, and spread it gently to cover, ensuring that the chocolate is sealed at the edges and no bits of sweet pototo show through. Keep refrigerated until firm, then remove from fridge , immediately peel off the paper cups, and allow to come to room temperature before serving (these are much better served at room temperature, but the cups will stick to them if you try to unwrap them once they’re no longer cold). Makes 12-15 truffle cups. Frosting Variation: After the filling is prepared, turn it into a deep bowl and refrigerate until cold and very firm, at least 2 hours. Using electric beaters, beat the mixture until it begins to lighten both in color and texture (it will become airy and fluffy). Use as desired to frost cupcakes, cakes, etc. Makes enough to frost a single 9″ (20 cm) round or square layer. so creative!! And I love the peachy potato color against the chocolate. I suppose those wouldn’t make it as long as it’d take the Canadian post to get me a batch, right? Well, then I’ll just have to make them for myself! What a fantastic recipe, Ricki! I believe you’ve really outdone yourself this time. I can’t even think of any words to describe this…you are amazing Ricki!!! Sweet potato TRUFFLES?! Not only does that sound amazingly delicious, it’s also amazingly creative! omg, you continue to bust out things i need to make! although i did finally purchase some virgin coconut oil at the store this afternoon! These look totally fantastic! I love the look and sound of the fluffy orange filling nestled in that chocolate shell. Wow, Ricki, just when I think I’ve OD’d on chocolate, you’ve got me craving more! I ran out of time, but am so glad you jumped in there as those look AWESOME! Wow, those sound delicious. I love sweet potatoes too. I never tried them with chocolate though. I figured the color would reflect the predominantly orange flavor, as well! Thanks so much! The chocolate does come through, surprisingly, and makes a nice match for the orange flavor. That is so funny! I actually considered carrot at first, but then thought, since sweet potatoes are my favorite, I had to go with them. Your pretzels did look amazing, however!! I had never tried them with chocolate either, I have to admit–but I really enjoyed the outcome! These look fantastic! If I had a little more energy for valentine’s day I would be tempted – oh and I feel I probably shouldn’t be making too much sweet temptation for E as he has a dentist appt in the morning of V Day. Wonderful photos too! If you keep creating such wonderful desserts a vol 2 of your cookbook will be needed before long! OH my goodness, I’m absolutely in raptures… Sweet potatoes are one of my favorites too, and I’ve always claimed (to the disbelieve of many others, sadly) that a baked sweet potato with just a bit of cinnamon tastes like dessert to me… and now you’ve created the perfect sweet potato dessert indeed! You. Are. Brilliant. I wish you could see how excited I am – I’m bouncing up and down with biggest smile ever, just imagining now luscious these taste! Veggie Girl took the words right out of my mouth — ARE YOU SERIOUS!?!? These look absolutely amazing Ricki! Brilliant is the word that comes to mind. I cannot wait to make them. Wow, Ricki, that is awesome! I love V-day even if it is kinda cheesy. 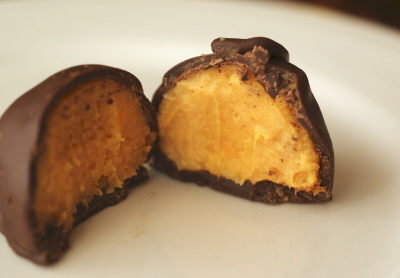 Sweet potato truffles are genius. Sounds like a winner to me! my god those look to die for!!!! i love sweet potatoes… and what girl doesnt love chocolate!!! Sweet potato and chocolate should appear together more frequently in desserts because these look and sound divine! Somehow, I have no more words for this – my mind is already wandering and lamenting the fact that one of these truffles is not in my mouth right now. (Seriously they look that great). I just have 3 words… oh my goodness!! That looks so amazing. I think I know what I want to make nat for valentines day!!! I’m so glad to hear you’re making progress on the book! And these are pure genius! You’re a culinary rock star, seriously. I haven’t been over to Susan V’s blog in ages, I need to check out the V-day extravaganza! These really look amazing! Just perfect! And thanks for the dipping step-by-step how-to! That is an absolutely brilliant idea Ricki and you will never guess! I bought a bag of sweet potatoes last night, with no idea of what I was going to do with them. I have dark chocolate too, now I just have to figure out how I could replace some of the vegan ingredients with veggie ones I have. Any tips? this has got to be the most glorious thing ever! hands down. oh my gosh – wow! i think i’m pretty much speechless! I love how creative you are. I never would have thought to do such things with sweet potato. Those are truly drool worthy. Wowie zowie! These sound complete amazing! I love sweet potato too and did a really fun article on it this fall. (I write a food column for a small local newspaper.) I can’t wait to try these! Love your blog, glad to find it. Excellent pictures! Come over and visit mine sometime. Sweet potato truffles – love it!! I love the idea of using it as cupcake frosting too, gonna have to try that! You are too creative for me…but I still love it!! My husband adores sweet potatoes…don’t tell him you posted this recipe, haha. Maybe next year! These are absolutely stunning. You are a true sweetheart! gorgeous!!! how creative!!!! i totally love it!! and how cute are those little designs on top of the truffles!?!?! Oh My God. That looks amazing. This is sweet potato at its best! I lurrrve the combination of sweet potato and chocolate! The lips on top of the one truffle are my favorite! I love sweet potatoes in any form, too. Sweet or savory, baked, mashed, braised. Inside truffles is a new one, but looks amazing. I was never one for Valentines Day. And then I happened to meet my (now) husband on Valentines and to keep in with when we met we got married on Valentines Day, so now it is cause for a celebration (and yes, I feel kind of pathetic that I got married on Valentines day but I can’t help when I met him :P). This recipe is genius. You never fail to amaze me with flavor combinations and techniques. I’m definately trying this out over the weekend. Thanks! These truffles are so amazingly creative and delicious looking they make me want to cry a little! With Joy, of course! Thanks for the inspiration! Wow! You always impress me with your awesome creative recipes! I never made truffles before and I think I really want to try your recipe! These truffles are beautiful! Inside and out. I love the color of the insides. I will definitely be making these. Thanks for checking out my celery roses. I just voted for you on the fat free vegan site :o) Good luck! Poor E–a dentist appointment on V-Day! I’m not thinking of vol 2 at the moment. . . let’s get Vol 1 finished first!! I agree, a baked sweet potato with cinnamon IS dessert! And I’m glad you liked these–wish I could share them with you! Thanks so much! I also like that color combo–more like art than dessert! Thanks so much! Let me know how you both like them if you do make them! Thanks so much, and for your comment! Aw, thanks! (Hope you still feel that way once you eat them! 😉 ). I lurrrve your comments! And hope your VD (ie, Valentine’s Day, that is!!) is great, too. Can’t wait to see what YOU whip up for the occasion! I’m with you on the sweet potato love. New for me, too, but I will be making these again for sure. I can’t wait to see what you do with these–your presentation and photos are always so gorgeous! Thanks so much, and for your comment! Let me know what you think if you do try them out. stunning. those all sound soooo delicious. holy guacamole this looks TO DIE FOR. My 2 favorite foods: yams and dark chocolate. Thank you is all I can say. What a creative combination.These are so on my list of things to make – they look so good and I LOVE the colour. Those look amazing! I wonder if I can trick my husband into liking sweet potatoes…. I have never seen anything like these- so innovative and so delicious looking! 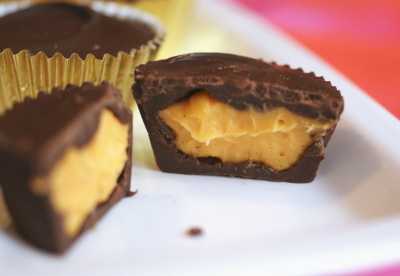 I am a huge sweet potato fan too so I am excited to make these. Thanks so much for the beautiful idea- this is my new favorite food blog and I can’t wait for your cookbook to come out! Pretty darned creative and I like that it’s made with spelt flower – even my brother would eat this….and that would be the highest of compliments. Yes, yes, yes, ditto all the above!!! These are great! I just tried the recipe and they turned out amazing. Thanks for the creative idea! I just came across your website searching for another wonderful way to use sweet potatoes and I am so happy!!! These look wonderful! I can only find whole spelt flour..I’ve looked at your page on substitutions and you suggest adding an addition 2 Tablespoon per cup. Do you think I should do that with this recipe?! Thanks! I love it used as frosting! I have to make some cupcakes and try that. Congrats on win too! These look amazing, and I have everything on hand to try them..except agave. Can I substitute maple syrup? Or is that just the wrong way to go? Ricki, you’re brilliant! I don’t even like baking, but I think I’ll try these. And thank you, btw, for all your work — now that I’m dating a gluten-and-lactose-intolerant I find your site more useful than ever. I made these and they were a hit, even with the “I don’t like chocolate” crowd! Mine didn’t look so pretty, and I ended up with a lot more, but they still tasted great! I don’t think I let the flour/agave reduce enough so I ended up with 2x as much filling. I’ll definitely try again. Ricki, you have outdone yourself. Pure brilliance! You are so creative! Sweet potatoes are my fave and I never thought to use them in truffles or frosting! I am so glad I found your site! These are really amazing! I noticed them on the Vegetable Love round-up after I had missed the deadline. They are a little like a Japanese sweet I’ve been wanting to make and are highly inspirational. And that frosting! I love the texture you achieved. Fabulous post. I used this frosting on a modified version of a clementine cake from Vegan yum-yum, and served it to a bunch of veggie-skeptic boys, and they loved it. Great frosting! I think I am in love with you. 🙂 The frosting is chilling. Part of it my children are already eating, they are dipping strawberries in it. Part of it it’s going to be made in truffles. Yum yum! I just made these. They turned out very delicious and my family really liked them. However, I found that almost no amount of freezing could make the fillings firm enough to dip into the melted chocolate. Instead, we drizzled the chocolate over the cold lumps of filling and returned them to the ice cave. Hoping for the best- hoping they well stay firm! I have no idea how you managed to make them look so pretty in your photos- but fantastic job. Although, next time I think I will only use this recipe as a frosting. Or perhaps try them as the cups- those are very pretty too! the two best things put together – I love it! These look incredible, I want to make them so so so much! However, I live in the middle of nowhere in England so ingredients like agave nectar and coconut oil are hard to come by. I saw on a previous post you suggested butter and honey, do you think I could substitute canola oil and powdered sugar, subsequently increasing the milk a little? Hannah, I don’t think canola would work as it’s a liquid and these are fairly soft as-is. You could try maple syrup and, if you use it, vegan margarine or shortening instead–the flavor might be a bit different, but I suspect the texture would be right. 🙂 And do let me know what happens if you try them out that way! This recipe is unbelievable. I only made the filling part and used it on top of zucchini cupcakes. 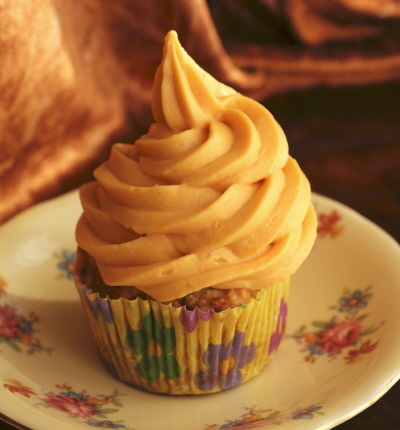 That has to be the world’s healthiest cupcake right there: zucchini and sweet potato. Yum yum. Thank you for your creativity!